It has been nearly two weeks after the City of La Feria received the most precipitation since Hurricane Dolly nearly a decade ago but the damages caused this time outnumbered those created by the tropical depression. According to a preliminary report compiled by city staff, more than 500 homes were impacted by the rainfall two weeks ago. Some farmers were even forced to break levees to allow the water to get out of flooded fields. 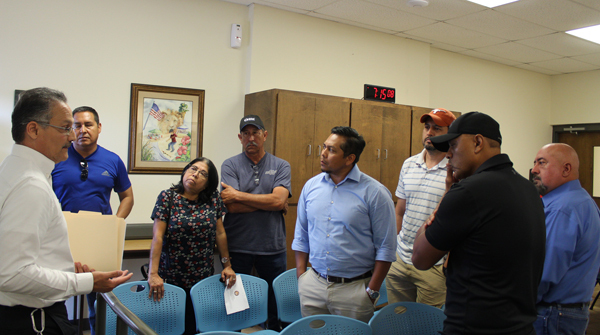 At last week’s meeting of the city council, more than a half dozen residents showed up at the meeting seeking answers and, possibly, assistance for the damaged homes. Among them were Felipe Macias and Marcos Islas. The two live in a neighborhood on Bixby Road, one of the areas impacted hard by flood water on the extreme part of town. Macias said his home got about 10 inches of water while Islas said his place took in 6 inches. Islas said they made the trip to city hall to find out what can be done to help them get back to normal and to seek answers so it will not happen again. City Manager Jaime Sandoval said they are aware of what happened and advised the group to record everything they can by taking photographs and videos. La Feria Fire & Rescue Department and the city has flood damage assessment forms for residents to pick up. Each form is to be filled out and returned in order to be included in a package the city will submit to the proper authorities. City officials were told some of the problems with water were caused by people driving in flooded streets. The water was pushed out and went into houses. In the meantime, people are advised to place debris, furniture and any materials in front of their houses as the city will it pick it up even though that is not its job. Also, mosquito and tick spraying has begun on sections of the city from 8 p.m. to midnight. On a related matter, a number of trash cans were swept away by the flood waters and are missing, presumably washed away or picked up by people who saw the large containers floating down city streets.